Summary: The film follows the journey of five dysfunctional friends who set out on a road trip in search of Fanny, the love-interest of the village's aging postman Ferdie. 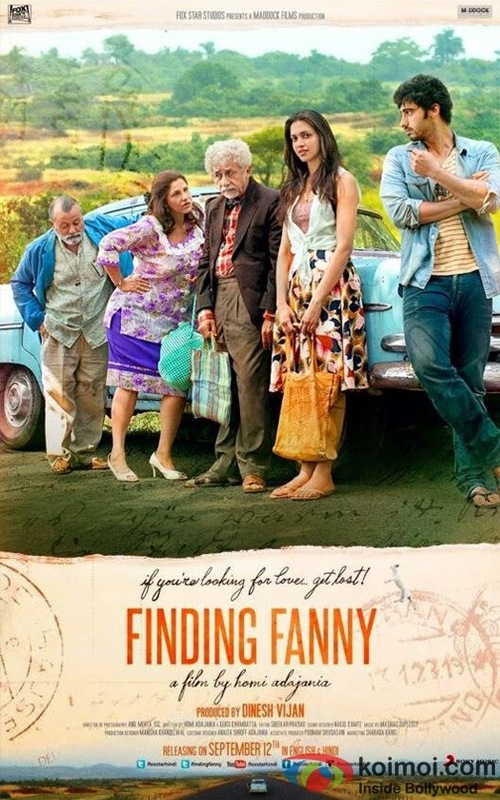 Finding Fanny is the third and latest offering from Indian filmmaker Homi Adajania. Co-written by Kersi Khambatta and Adajania himself, Finding Fanny stars Naseeruddin Shah, Pankaj Kapur, Dimple Kapadia, Deepika Padukone and Arjun Kapoor in pivotal roles. The plot of Finding Fanny revolves around five queer residents—a lovelorn senile postman, a voluptuous old vixen and her widowed daughter-in-law with a heart of gold, a sullen mechanic left heartbroken by the young widow, and a mercurial artist with a morbid obsession for curvaceous middle-aged women—of a fictional Goan village of Pocolim marked by a state of dreamy torpor, resonating with the melancholy of solitude perpetuated by an apparent absence of physical love. Brought together under no less than bizarre circumstances, these five people undertake an enchanting road trip (perhaps to break the monotony enveloping their lives) which would change their lives forever. 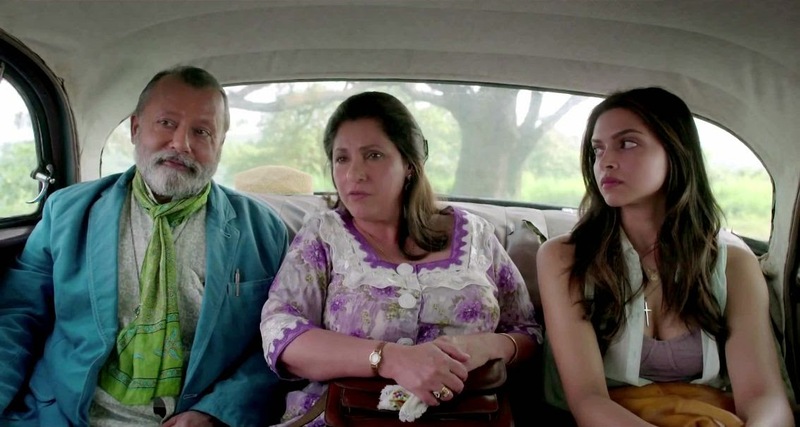 Finding Fanny poses several meaningful questions about love, a couple of which instantly comes to one's mind. (i). Which is greater, the pain we feel when our love goes unrequited or the elation when it gets reciprocated? (ii). Is it worth loving someone more than our life without even caring to figure out what that person thinks of us? The village of Pocolim in Finding Fanny is highly reminiscent of Macondo, City of Mirrors, from One Hundred Years of Solitude and one can only wonder what kind of influence the luminary work of Gabriel Garcia Marquez would have had on Adajania whilst he wrote the first draft of the screenplay during his month long stay at a village named Salvador do Mundo in Goa. But, Marquez doesn’t seem like the only one to have influenced Adajania. A wide range of artists appear to have influenced him in one way or the other: right from William Shakespeare to Charles Dickens, Emir Kusturica to Wes Anderson, Saadat Hassan Manto to Gulzar. The striking contrast between the movie’s humorous tone and its sombre mood reminds this critic of a Hindi TV Series called Gubbare (1999–2000), which was helmed by a high profile creative team that consisted of Gulzar, Vishal Bhardwaj and Saurabh Shukla, among others. In addition to depicting the endless drudgeries of human life, Adajani’s film also shows us those rare moments of extreme ecstasy and agony (consider the sequence wherein a newly married bridegroom kisses his wife and moments later chokes on a piece of his own wedding cake) that seem to punctuate the mundaneness that encompasses our lives. Amidst the ever-changing business horizon, Hindi cinema finds itself at the crossroads. There’s no denying that the formula for movie’s commercial success has changed drastically over the last decade or so ever since advent of multiplexes. The urban viewers have grown smarter while the rural viewers have become choosier. The Censor Board has also grown more mature with time. All this has made the medium more formidable than it has ever been, thus giving rise to a kind of cinema that is not only richer in content but also more potent in terms of propagation. However, Hindi cinema still has a long way to travel before it can match the superlative global standards, not only in terms of technique but also in terms of treatment. As essential as it is to the continuous evolution of the medium, art cinema is far from being the need of the time; what we actually need is a hybrid cinema of sorts. But, what's really disconcerting is that Indian commercial cinema has of late become an inept instrument in the hands of a bunch of money mongrels ill-equipped to understand the intricacies of filmmaking. We need to explore all the available options and search for a middle path wherein a successful trade-off can be established between the two streams of cinema, mainstream and offbeat, in order to reach the best possible outcome. In recent times, Homi Adajania’s Finding Fanny comes across as perhaps the best example of the kind of hybrid cinema that can prove to be a great savior for our highly volatile film industry. By making a motion picture like Finding Fanny, Adajania has demonstrated, against all odds and in the utmost comprehensive manner, how the marriage of creativity and star power can be seamlessly brought about while still operating within moderate budgets. Finding Fanny is a perfect amalgamation of mainstream and offbeat cinema, and its early success only shows that the formula holds a lot of promise, and, if leveraged upon, can become a viable option for creative filmmakers to realize their dream projects. Overall, Finding Fanny is an important work of Hindi cinema that will most certainly prove to be great source of inspiration for aspiring filmmakers. The movie seems to work well on both the technical and emotional fronts: The cinematography, editing and music are all topnotch; the acting is also solid all around and there is enough room for character development. While Deepika and Arjun put up a decent show, it’s the veterans who steal the show with their supernal performances. 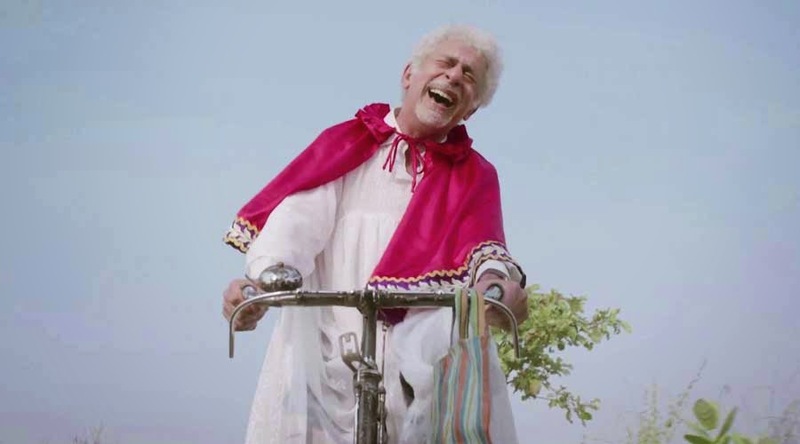 While Naseeruddin Shah and Dimple Kapadia are absolutely mesmerizing to watch in their respective roles (Shah’s low-key performance tugs at the heart; Kapadia’s lively portrayal packs a punch), it’s Pankaj Kapur’s portrayal of the obsessed painter, Don Pedro Cleto Colaco, that stands as first among equals in the view of this critic. In its essence, Finding Fanny come across as a meditation on life and death. But, there is a great contrast in the manner the movie approaches life and death. While it presents life as a burdensome ordeal, it strangely treats death with a touch of levity and indifference as if to mock our frivolous existence. The movie also serves to be an interesting case study on the lives of the Goan Catholics. The film is available in both English and Hindi but for this critic the latter version stands out. The movie pacing is quite slow to begin with which may not particularly impress the casual viewers, but a patient viewer will cherish it for a long time to come. A must watch for those on the lookout for a breath of fresh air! Thanks for the review, I really wanted to watch this and managed to miss it upon release... I hope to catch it at the soonest! The pleasure is all mine... I am sure that you will enjoy the film as and when you watch it! Considering its moderate budget, it has done considerably good at the Box Office. So, yes, it can be called a hit. I watched this movie today and truly liked it. I think the IMBb rating it has is not just. It should be certainly something around eight or at least seven and half. Also I am surprised as to why It did not win any major award in any field. This is one among very few such Bollywood movies after watching which I felt like like reading some critic review on it. This is my first read from Potpourri of Vestiges and I must say that I got some sense of satisfaction after reading this so well written piece of yours. Thanks! Thanks for sharing your valuable thoughts... I am really glad that you enjoyed reading the article. Do check out some of our others articles as well! Speaking of Finding Fanny, I feel that it's one brilliant film... it's a real pity that such films often fail to get their due in a country like ours. You see cinema in our country at this point in time is not in the hands of people who understand and appreciate art. We have a great potential but often the people with money end up dictating their terms and so Indie cinema is our only hope... the people want to watch good cinema... it's just that they are not exposed to it. Demand creates Supply and Supply creates Demand... it's like a cycle and so the key is to have more such indie filmmakers with the attitude to make unadulterated films. As to IMDb's ratings, they are user driven and so one cannot really blindly rely on them but they offer reasonable guidelines to judge movies.